The Jungle features 3 platforms and a sturdy cat cabin, a snug hidey-hole for cats to relax in privacy with a cosy stuffed cushion and removable lid. Covered in soft crushed velvet, the Cat Jungle is the perfect activity and sleep station for spoilt cats. Trixie Wall Saver Corner Cat Scratch Pad ---Provides a dedicated place for scratching ---Helps protect furniture and interior furnishings ---60cm x 32cm (12.5") ---Available in Black ---The Trixie Wall Saver Corner Cat Scratching Mat in Black has been specially designed to protect your wall coverings from scratches by your cat. 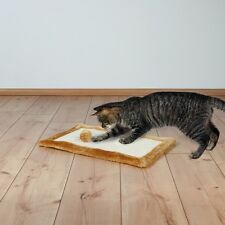 This cleverly designed scratch mat can be mounted onto any corner in your house with ease to provide your cat with a dedicated place for scratching. It has been covered in sisal which is a hard wearing fibre that will effectively sharpen your cat's claws. The outer edge has been embellished with plush to provide your cat with a great contrasting texture to explore for added stimulation. 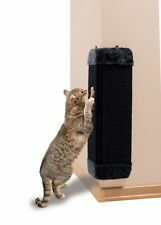 The Trixie Wall Saver Corner Cat Scratching Mat in Black is suitable for both adult cats and kittens to use. This scratching mat can be put nearly everywhere. This light weight mat has a plushy rim as well as a toy fixed on an elastic. The sharpening of the claws is very important for cats. Plush Sisal Scratch Mat by Trixie. Friends as they maintain their claws. Rear side covered with plush. of your walls to keep their claws in shape. K&H Pet Products Cool Bed III Cooling Dog Bed Medium Blue 22" x 32"
Keep your pets cooler than ever with the new Cool Bed III. No electricity is required to operate the Cool bed III and these beds are attractively designed and allow a cool spot for dogs. Our unique Cool Core diverts the liquid better than ever throughout the bed for advanced cooling power. Trixie Cat/Kitten Scratching Mat Floor/Wall Mounted Plush Scratcher ---Scratching Mat with Plush Outer ---Size 55 x 33cm ---Elastic Toy Gives hours of Fun ---For Cats and Kittens ---This scratching mat can be put nearly everywhere. The mat has a plushy rim as well as a toy fixed on an elastic. The sharpening of the claws is very important for cats. In order to stop your cat from scratching on wallpapers or furniture, it is necessary to offer your cat special scratching furniture. Sisal is a natural fibre, which helps your cat to take care of its claws. Size 55 x 35cm. The cat scratcher provides cats with a premium corrugate surface which grooms their nails Cats appreciate the tight nooks and crannies that the corrugate proves which helps them keep their nails healthy The scratcher is at an ideal scratching angle and is reversible for double the scratching life This package contains one 8x19.5x2 inch scratcher Imported. .
1 Laser Topper Electronic Motion Cat Toys. Satisfy your cat's need for Exercise. It is an interactive cat toy that doubles as a feline exercise machine. In addition, it will keep your pet happy and healthy with this rotating laser toy. Your cat deserves a Catty Curve! With a unique shape designed for scratching, stretching or lounging, and tough sisal material that can stand up to the most serious shredders, Catty Curve is a perfect solution for claw maintenance and to deter your cat from unwanted scratching! This package contains one 12x6.5x10 inch cat scratcher Imported. .
Just hang the board where you want, introduce the cat to it, and watch the cat enjoy scratching it over and over, stopping the cat from ruining the sofa's 'eh! Hanging Scratch Boards. Sick of seeing the bloke from accounts squirming uncomfortably at his desk?. Well, there'll be no need for Itchy Ian to fear those uncomfortable personal niggles when he has the executive ballscratcher at hand. This cardboard cat scratching box by Petface is great for keeping your cat entertained, healthy and alert! Size: 47cm x 22cm x 6cm (18.5" x 8.5" x 2.5") approx. Precision Pet 2000 Sleeper 23 in. It is constructed from a luxurious plush fabric for a comfortable surface. Pets love them in crates, carriers, dog houses, SUV's or anywhere. Products must be clean with no evident wear, or it may be refused. - Size(L*W*H): 72*47*52cm - Package Includes: Pet Stairs - Max load: 99.45lbs / 36kg - Perfect for smaller dogs or older dogs and cats suffering from arthritis, painful joints, overweight bodies or hip dysplasia. - Suitable for small and medium dogs, cats and other pets - No assembly required, foldable, stable and durable. This fun decorated feature is ideal for your kitties to get away from the hustle of the human world below, providing them with the safety and comfort they require. The pine bridge comprises of two shelves and a hanging walkway between the two. The bridge pictured is in a walnut stain with brown brackets. Natural pine, white and black stain is also available with a choice of white, brown, black or silver brackets to suit your decor. Red, Blue and Yellow wood dye is now available. The length of the bridge is 140cm and the width is 26cm. Please allow 1-2 weeks for delivery as each item is handmade to order. 30" L x 24" W. Features: 100% recycled fiber fill. Attractive, high quality fabrics. Machine washable. Self warming bed Reflects and retains your pet's radiated body heat. Space blanket technology. The thickness of Kozy Therapeutic Sleepers is great for older, arthritic dogs, as it alleviates pressure points that cause joint stiffness. Kozy Therapeutic Sleepers are reversible and available in six sizes and four patterns; Leopard, Zebra, Giraffe and Panther (Black Velvet). Cat scratch board natural scratching instincts Light weight with the honeycomb design, durable and brings more fun to your cat Made of corrugated liner board, don't worry about hurt cat's toes, cat won't swallow it and it's facilitate for cat's defecation. Condo Height: 57.25". Easy to follow step by step instruction. Color: Navy. Surface Material: Faux Fur. User must follow the direction given and any misuse of this product is at his/her own risk. NOTE : All of turbo parts and performance may require slight modification in order to fits perfectly. These include: Dickies, Blackrock, JCB, Portwest, Oregon, Gatemate, Mark Todd, Lincoln & Red Gorilla. Ideal for pets that like to stretch out. Removable cover is machine washable for easy care. Features soft & classic plaid plush with coordinating micro suede. Available in 3 Assorted Colors! Blue Brown Gray. Pure Comfort Bedding - White: New! Oxbow Pure Comfort bedding is made of 100% pure, never-printed paper to create a clean, safe, and ultra-soft bedding material for pets of all sizes. Cats will be entertained with the hanging ball. Suitable for cats of all ages. Channel Islands, Isle of Man, Isle of Scilly, Isle of Wight, Scottish Isles, Scottish Highlands and N.Ireland, Republic of Ireland. 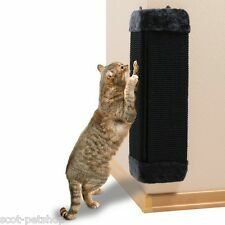 With an extra soft plush base your cats can have a comfortable place to reach up and stretch while they scratch. It will save them scratching your soft furnishings and curtains and they also have a toy on the side to play with. Here is your opportunity to truly pamper your cat (s), this Cat Climber is a luxurious and exciting assault course for any cat. 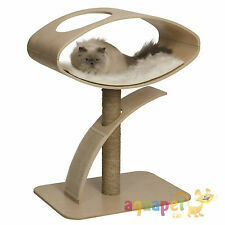 Features include three scratching towers, 3 hanging balls, 2 sleeping boxes and 8 platforms. Perfect for any outdoor cat. This is made with 600 denier nylon with a vinyl backing that makes this waterproof. The roof hangs over the 2 doors to keep cats warm, safe and dry. Easy to assemble with velcro walls and a zippered roof.